We started pretty much like you, restoring, maintaining and driving early VW Beetles, enjoying the experience and research aspects of finding the "correct" parts for our project cars. But we hit a few brick walls when we found that there were some parts that just didn't exist. Anywhere. Not new, not used (that we could find anyway), not reproductions. So we had to make them ourselves. It didn't make sense to just make one part, and we knew a few other people who were looking for the same part. So we made three or four. Then some people told some other people about something that we had made and we got asked to make some more. We built our shops up slowly, acquiring new tools, finding suppliers for raw materials and learning new, more efficient techniques for manufacturing things. When we began to take the endeavor seriously as a possible business, we purchased a domain name and launched a website to promote or products and services. We sought to capture a single market in hobby; to manufacture and provide goods a services that simply didn't exist already. We didn't want to compete with anyone, even if they made shoddy products. Our pride was our workmanship, quality, and uncompromising business principles with a commitment to customer satisfaction. Today, Zarwerks keeps us busy. We still hold down "day jobs", but the business does well and funds our own continuing vintage VW hobbies. We still both own early VWs and work on them and drive them often. Between us, we own 3 split window Beetles and 3 Oval window Beetles. ZAR Werks is an internet resource for restorers of early Volkswagen Beetles. It is the brainchild of a couple vintage VW enthusiasts who possess various skills and materials and endeavor to fill voids in the hobby, making parts and services available that are not already available elsewhere. Accuracy and quality are everything. The products and services here are worthy of the very best restoration. Feel free to browse this website and look over our offerings. Note that ZAR Werks is not a storefront, nor a commercial business. It is merely a hobby business that is run collectively by a couple of enthusiasts. Each one of these people represent a subset of the products and services listed here, and each one is wholly responsible for the sale, delivery and quality of that product. For that reason, the "purchase' and "inquire" links under each product or service will open an e-mail window directed to the person who provides that part or service. 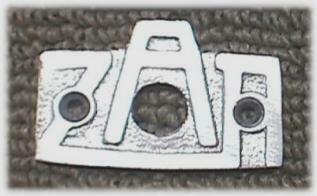 The acronym "ZAR" by the way, and its style as used in the logo, comes from a small pressed steel plate that was found on the forward firewall carpet of '48-'51 split window Beetles and through which the fuel tap reserve lever protruded. The plate indicated the function of the lever's three positions, Z for "zu" or "closed", A for "auf" or "open", and R for "reserve", the same word in both English and German. This small plate is one of the finer details of early vintage VWs and represents very well the purism that many vintage hobbyists embrace. Original pressed steel ones are very hard to find, but we offer a very nice cast reproduction on our "New Parts" page. Maybe you got a chance to stop by and see us at the VW Classic 2003 in Irvine CA in June. It was nice meeting you if you did!